With its modest base price, exceptional repair and reliability history and class-leading resale values, the 2016 Honda Accord sedan is an easy choice. Sleek new styling and a host of cutting-edge tech options only sweeten the deal. There is a large amount of chrome detailing. I have owned a 2016 Honda Accord ex-l v6 with navigation and sensing for almost 5 months now. I bought the car with 30, 000 miles on it and it has been great ever since. I have faced no problems so far, but it is still a pretty new car and is very well taken care of. The performance is great. You can feel the shifts in the gears when you drive very smoothly. It is extremely reliable. I wouldn't be concerned or worried taking this vehicle on long trips at all, it is still very new and has showed no signs of any problems. It is very comfortable as you can shift the seat to your comfort. The features make me feel extra safe, as if a vehicle is in front of you and breaks quickly, the car will sense it immediately and alert you to brake. It also has the technology that in case you do get into a crash, it calls for help automatically for you, so you know you'll never be stranded in an accident with no help on the way. Use the gas economy setting when you do not need quick pickup. Save cash! 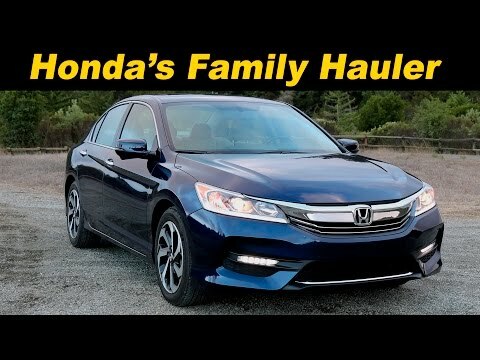 My Honda Accord (2016) gets about 45 MPG on the open road - even going 70mph. Both the outside and inside of vehicle is attractive. I love the feature that allows the driver to use an economy setting for gas output. This is great when driving in the city when you do not need swift pickup. And when you want that pick up, you only need to press a button. I also love the large backup camera screen. The dual zone climate control is wonderful for people who do not agree on temperature. The trunk is larger than expected going under the rear seat. Before I purchased this car, I had heard that the seats are uncomfortable for those under 5'3", but I simply added a 1" memory foam sit-upon and that makes my back comfortably fit the Honda seat. Great car, would definitely purchase again! My Honda Accord is a very reliable car. I have had it for coming up on 3 years now and have had no problems with it thus far. The only maintenance that I have had to do is getting the oil changed (I recommend going to the dealer) and getting my tires rotated. There is plenty of legroom in the back seat of the car, my dad is 6'3 and he fits very comfortably in the back seat. One of the best features about the car is the camera on the right side mirror of the car. I use it all the time and prevents me from having to turn my head to see if a car is in my blind spot on my right hand side. I really wish that there was one on the left side as well. Overall, I have no complaints about my car and would absolutely purchase it again.